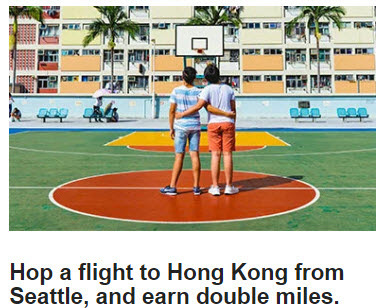 You can earn double miles on new Cathay Pacific flights, flying nonstop four times weekly between Seattle and Hong Kong. Register your Mileage Plan number before your first trip. Travel on qualifying Cathay Pacific nonstop flights from March 31, 2019 through May 31, 2019, and you'll earn double Mileage Plan miles. Register your Mileage Plan number before your first trip and no later than May 31, 2019. 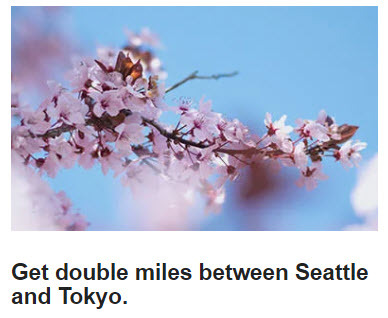 Travel on qualifying Japan Airlines nonstop flights March 31, 2019 through May 31, 2019, and you'll earn double Mileage Plan miles.